Run SDS-PAGE on the amount of hemoglobin from yesterday's lab. The procedure came from Dr. Hartings lab notebook. 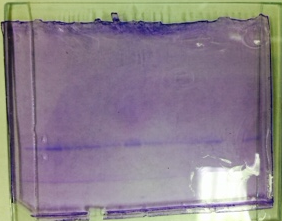 Two additional samples were made using the 2 nM of pepsin and 0.2μM of pepstatin solutions yesterday. It was prepared just like the SDS-PAGE samples except stored in a refrigerator. Observations of the SDS-PAGE with the samples from yesterday. This page was last edited on 26 September 2017, at 23:24.